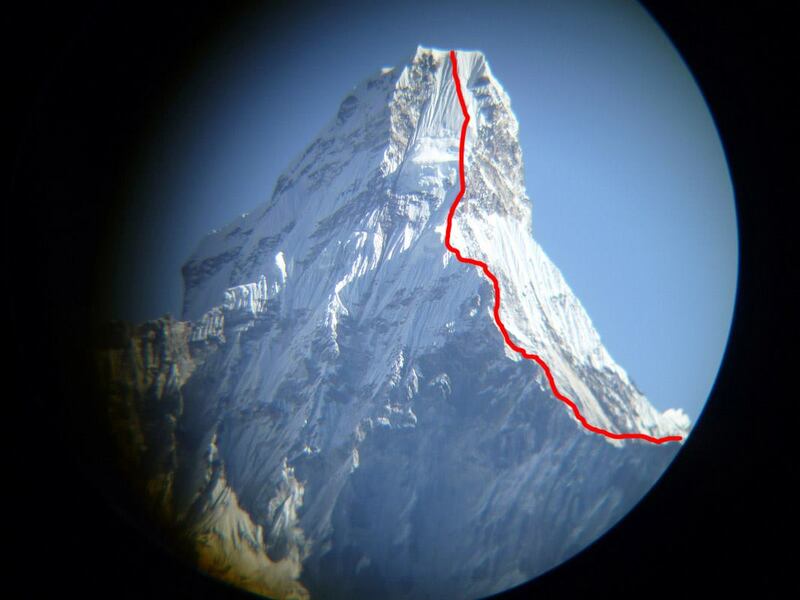 Macedonian climbing team Ilina Arsova and Ilija Ristovski successfully climbed the Himalayan summit Ama Dablam 6856 meters high, on 18th of November 2011. Technically demanding and breathtaking Ama Dablam is one of the more difficult accessible peaks in the Kumbu region. The route is a combination of rock, ice and snow climb in duration of about 1500m vertical line. The average exposure is 70-90% icy slaps, vertical on some parts few pitches long. Starting below camp 1 (5800m) all the way to the summit the route is marked with fixed ropes with different age. Therefore it is very important which one you’d choose to use. Anyway you might feel better if you only use the ropes as a back-up but don’t put your entire weight and trust on them. The route description starting from the base camp (4650m) goes as following. Advance Base Camp is settled at around 5300m, it is good sleep over place while acclimatization period. Still we didn’t use it on the climbing session. Camp 1 (5800m) is pretty comfy place settled on the top of a steep boulder field. Camp 2 (6000m) is not such a pleasant place except for the stunning scenery. The tents are erected on the top of the “Yellow tower”, on a small horizontal platform where only 3-4 tents can fit in. They are all fixed with ropes, and movement around is very dangerous. Unfortunately the C2 smells like public toilet where some disrespectful climbers and Sherpa are leaving their rubbish on the spot. Our itinerary had a long day from camp 1 to camp 3 to avoid sleeping at above described camp 2. After camp 2 the terrain is getting more and more icy. Steep couloirs (the great couloir) and tiny snowy ridges (the mushroom ridge) took us to camp 3 or 2.9 at around 6300m. Camp 3 is located just below the “Dablam” – the hanging glacier. In 2006 the hanging glacier avalanched and caused the greatest disaster on the mountain executing complete expedition spending a night at camp 3. That is why the camp is moved to the top side of the “mushroom” for avoiding avalanche danger from the cruel hanging Dablam. 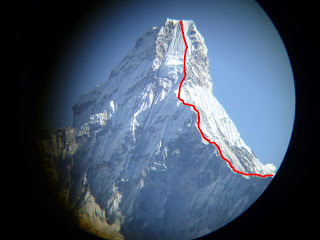 In the local Sherpa dialect Ama Dablam means Mother with a necklace, the Dablam is the necklace. Camp 3 – summit – Camp 3 is another long day. It took us about 5h to the summit and 2:30h down. Camp 3 is well exposed and quite windy so you can’t count on too much sleep there. Next day we went all the way down to the BC. The steep mountain makes the climber to gain altitude very fast which can result with altitude sickness. Good acclimatization is crucial. Therefore we spent two weeks trekking and climbing on smaller peaks in the region. The expedition was made in good weather conditions, pretty much according our plans. Psycho – physically we felt well prepared, holding good on the altitude and the everyday’s effort. This was the first Macedonian team waiving the national flag on the top of Ama Dablam. Arsova became once again first Macedonian women on a Himalayan summit with this height and difficulty of technical ascent. We would like to thank the special hospital "Filip 2", Casio Pro Treck, My time, and Vitalia healthy food for supporting this expedition.